No more wondering if the mail is gone and no more wasted trips to the mailbox just to find it empty. Simply mount the sensor on your mailbox door using double-sided tape (included) and plug the Receiver into an electrical outlet anywhere in your home. When the mailbox door is opened, the Mail Chime will beep four times. And, in case you missed the beeps, a bright red LED light will tell you the mail has been delivered. You'll love the convenience of knowing when your mail is delivered. 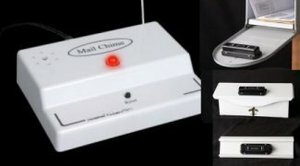 The Mail Chime also acts as security device notifying you that an unauthorized person has opened your mailbox door. • Easy to install - no wiring • One year limited warranty • FCC Approved • Not for use on mailboxes with vertical hinges. • Distance may be reduced by extra heavy gauge metal mailboxes or aluminum sided houses.